Get your tickets to the 37th Annual MARFC Dinner Dance & Awards Banquet on January 18, 2003 now very few seats are available. If you need a ticket contact me a president@marfc.org by January 10, 2003. Jack Roush Winston Cup team owner will be with us to receive our Personality of the Year winner. The Motor sports Writer of the Year will be Mike Brudenell from the Detroit Free Press. Stan Yee will be presented our Lifetime Achievement Award for his nearly 50 years of building and owning championship cars with many great drivers. With ESPN & Bob Jenkins receiving the Michigan Media Award of Excellence for their many years of Motorsports coverage. The MSPA will be honoring their Promoter of the Year at our banquet. We also have a few special surprise awards. So be sure to get a ticket and see these great supporters of auto racing as well as all of our MARFC track Champions. Another outstanding meeting we had over 100 people with kid’s and parents. Each child was given a great gift from Santa as well as winning a door prize and all went home with a goody bag filled with books, crayons, and a hand made teddy bear. All in attendance had a wonderful time. Thanks to the Dublin Pub for donating the lunch for the kid’s and to the entire Russo family for bringing deserts for all. 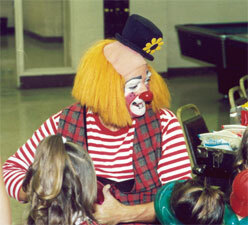 “Fidgit” the Clown was on hand he made the kids laugh and made balloons and did magic for them to enjoy. 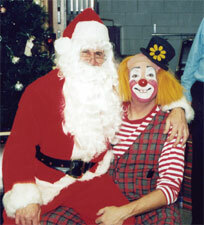 ” Willie” the Clown also was there to help with the kids and help guide Santa to the hall. 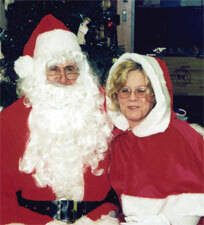 Along with Santa, Mrs. Clause made a special appearance this year, bringing some extra goodies with her for all the boys and girls. Fitget could take this show on the road. Fitget has a great time with the kids, keeping them entertained until Santa arrived. 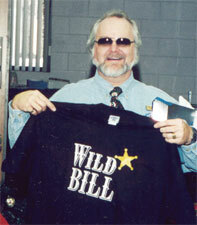 Santa brought a special gift for our own President “Wild Bill” Branhart.